Mateo Macias de Avila is all alone in the world. His parents have died from the plague and there is nothing to keep him on the family farm any longer. So, with a mangy and very ugly dog following at his heels, Mateo heads south. It is a hard journey and after two months on the road Mateo is thin, hungry, and desperate. On evening at an inn, where he is playing his guitar to try to earn a little money, Mateo meets a man called Gonzalo Gomez de Espinosa. Espinoza offers Mateo a chance for a new life. He is going on an expedition with the famous Portuguese captain, Fernando Magallanes and he will get Mateo a job as cabin boy on one of the five ships that are going on the journey. Quickly Mateo agrees to go with Espinoza and soon enough he is in Seville. For a while Mateo works on the San Antonio under Captain Juan de Cartagena but when he and his friend Rodrigo are caught spying on Captain-General Magallanes, the boys are transferred to the Trinidad, the captain-general's ship. Over time Mateo begins to form his own opinion of Magallanes rather than always agreeing with Rodrigo who hates the man from Portugal. Rodrigo always thinks the worst of Magallanes but Mateo begins to appreciate that the man is wise and a good leader. The journey is a trying one from the very beginning. There are violent storms, a period of time when the ships are becalmed, the food and water goes bad, and the men wonder if they will ever get to their destination – wherever that is. When the crews are finally told that the plan is to sail west, instead of east, to get to the Spice Islands, they are appalled. Why would anyone want to try such a dangerous thing when everyone knows that you can get to the Spice Islands perfectly well by sailing down the coast of Africa and then across the Indian Ocean? But Magallanes is adamant. They have to find the passage at the bottom of South America which he is sure is there, and go west. For months the ships look for the passage. The weather worsens and worsens, and finally Magallanes agrees to set up a camp. It is during this time that three of the captains in the fleet mutiny. Fortunately, with the help of Mateo and Rodrigo, the mutiny is put down. One of the captains killed during the ensuing crisis, one is executed, and the other is marooned. In October of that year, 1520, the fleet finally found the passage that Magallanes was looking for. They went through it, but lost one ship in the process. Magallanes promised his men that the journey would be much easier in the Mar Pacifico but, alas, the greatest trials of all still lay ahead. 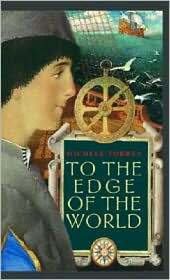 In this remarkable account of what it must have been like to make the first trip around the world, Michelle Torrey brings the events of the past to life. Through Mateo's eyes we experience the terrible dangers and misery that the men in Magellan's fleet suffered. In addition we see how Mateo is changed by the events that he experiences. He learns that honor which is for show alone is no honor at all. What matters is what is inside and keeping up appearances is of little consequence in the big scheme of things. Mateo forms strong ties with some of his crewmates during the journey and suffers greatly when these friends are lost in battle. As we read it is hard not to feel great compassion for the men who made this extraordinary journey. After all, in the end, only eighteen of the two hundred and seventy-seven men who started out on the voyage came home.